Dorothy Gale is the main character of both the 1900 children's novel The Wonderful Wizard of Oz and the 1939 film classic The Wizard of Oz. Her look is iconic, from her blue and white dress to her ruby red slippers. If you'd like to capture Dorothy's look for cosplay, fancy dress, or Halloween events, this article has some tips and suggestions to help you. 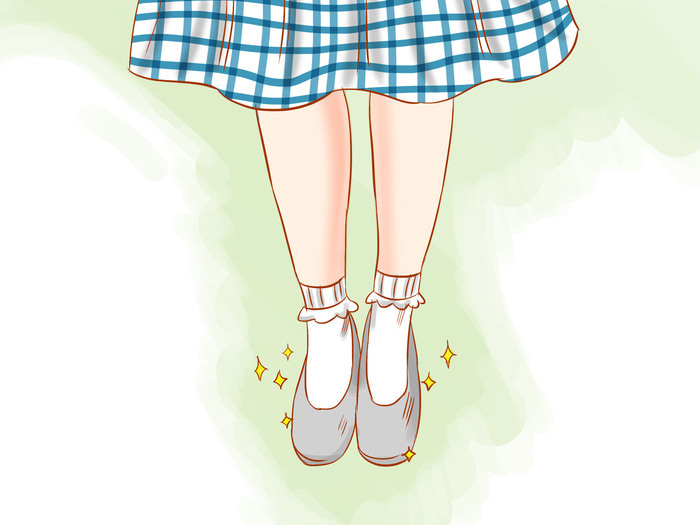 Obtain the well-known gingham dress worn by Dorothy's movie character. Make sure to find a gingham blue and white checked dress. The best pattern has small blocks of color instead of large ones. Many costume stores sell Dorothy costumes in varying levels of authenticity, from near replicas of the movie costume to modern, updated versions with shorter hems and lower necklines. If you are not crafty, or you don't want to spend the time creating your own dress, purchasing a dress is the best option. Browse online for Dorothy's dress. Talented people sell homemade, hand crafted versions of Dorothy's dress. You can find dresses of varying styles on crafting marketplaces like Etsy. Sew Dorothy's dress. If you are crafty or want a more authentic look, try sewing your own dress. There are multiple sewing patterns from Simplicity, McCall's, and others available for purchase that can help you recreate Dorothy's dress. If you are trying to replicate the outfit from the movie, make sure to pay attention to the length of the skirt. 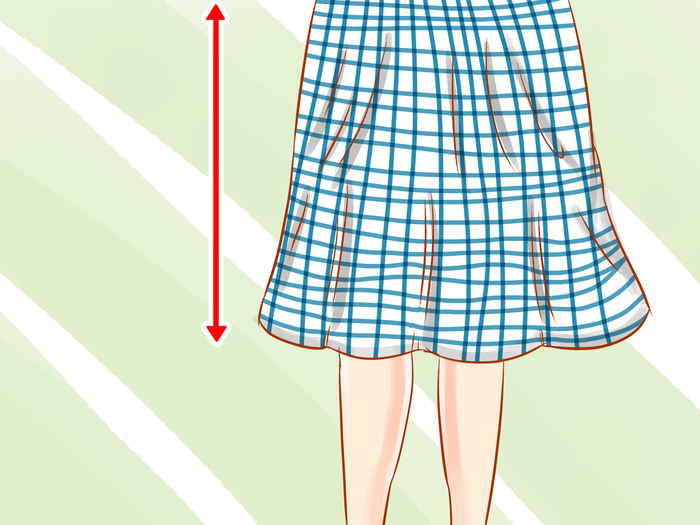 Dorothy's skirt comes just below her knees, so make sure your skirt falls to the same place. 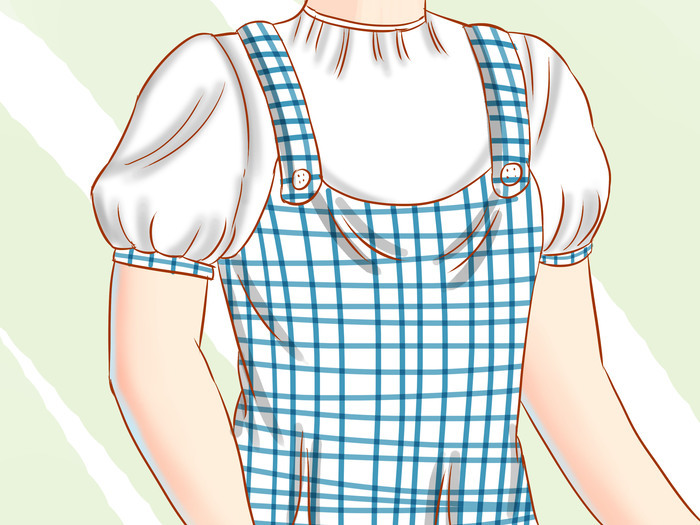 Dorothy's dress is a pinafore dress, which is a sleeveless garment usually worn by young girls as a dress over a blouse. Sewing a simple pinafore dress with a blue and white gingham fabric will serve as a great costume. Place a white blouse under the dress. Dorothy's blouse was a high-necked, buttonless blouse with puffed sleeves. If you can't find an exact match, try any short sleeved blouse. Add ruby slippers. Many major retailers sell flats or heels covered in red glitter. 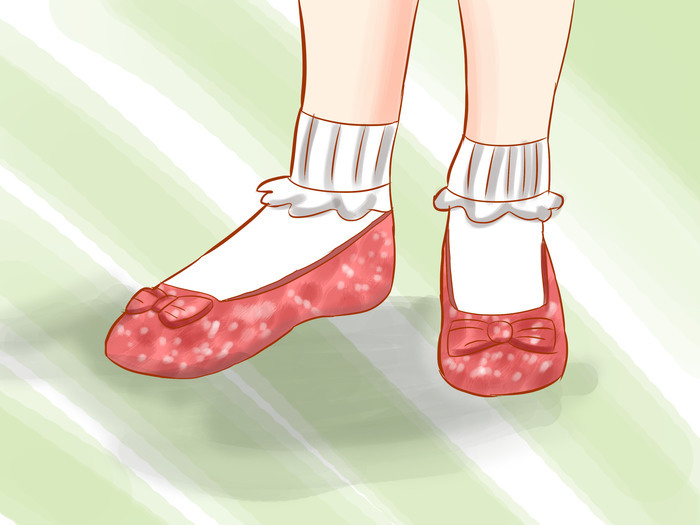 Dorothy's ruby slippers had bows on top, so if you want to be authentic, try to find a red sequined bow to add to the top. You can make your own red glitter shoes. Take a pair of shoes with a wide heel around 2 inches tall. Clean the shoes, and then in small sections begin to cover the shoes with fabric glue. Apply a liberal amount of red glitter to the section covered in glue. Wait for the glue to fully dry before applying glitter to other sections or filling in holes. Touching the glitter before the glue is dry can cause bald spots. Continue applying red glitter until the shoes are completely covered in glue. Sequins can also be used when making homemade ruby slippers. Take a pair of shoes with a wide heel around 2 inches tall. Purchase a spool of red sequin string. Using fabric glue, glue the sequin strings in vertical lines along the side of the shoes, making sure none of the shoe's original surface is peeking through. Cut the sequin string at the shoe's edge. Make sure to also cover the heel with sequins, and add a line of sequins along the mouth of the shoe. If you want to be more authentic to the book instead of the movie, wear silver slippers instead of Dorothy's iconic red ones. Wear socks with your slippers. 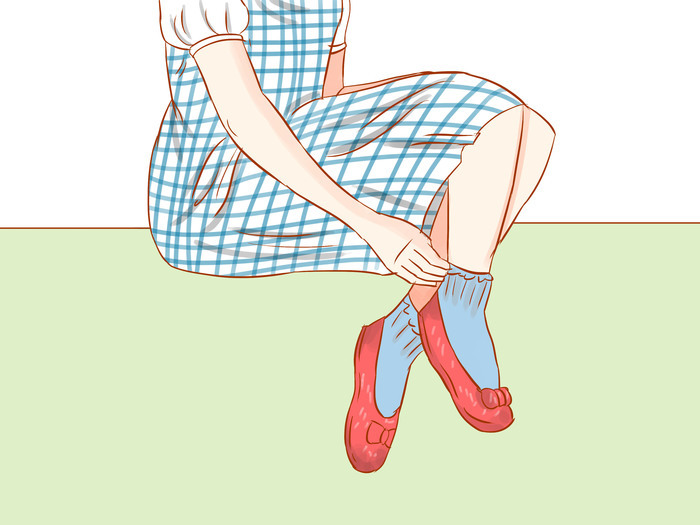 Dorothy wore short ankle socks in a light blue that matched the blue in the dress. Fold down your socks. White socks might also work if you are unable to find blue; just make sure they are ankle height. Copy Dorothy's braids. 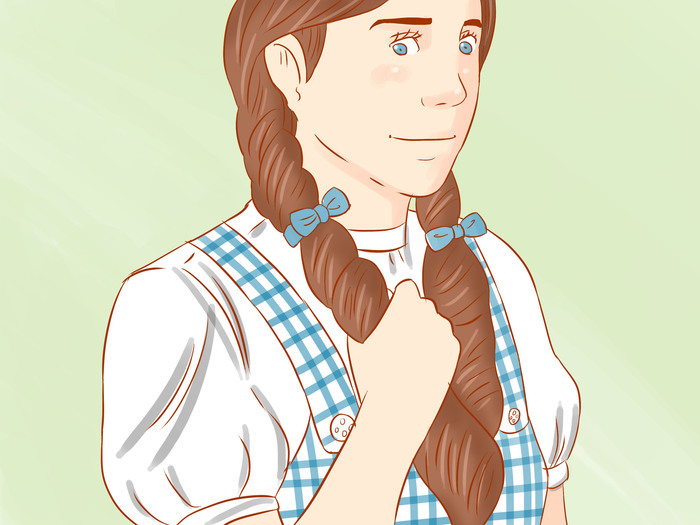 Part of the iconic Dorothy look is her two braids, but there is a little more to the look than just parting your hair and braiding. Part the hair in the middle from the forehead to the neck. Starting with the strands at the part on one side of the head, start twisting the hair back towards the part, adding more hair to the twist as you make your way down the hairline. Make sure to keep the twist tight. When the twist is around the ear, hold it tightly in place with one hand while you begin a three-part braid with the other. Use a simple braid to braid the hair until around the shoulders, then secure the braid with elastic. Use a curling iron to curl the ends of the hair into ringlets. 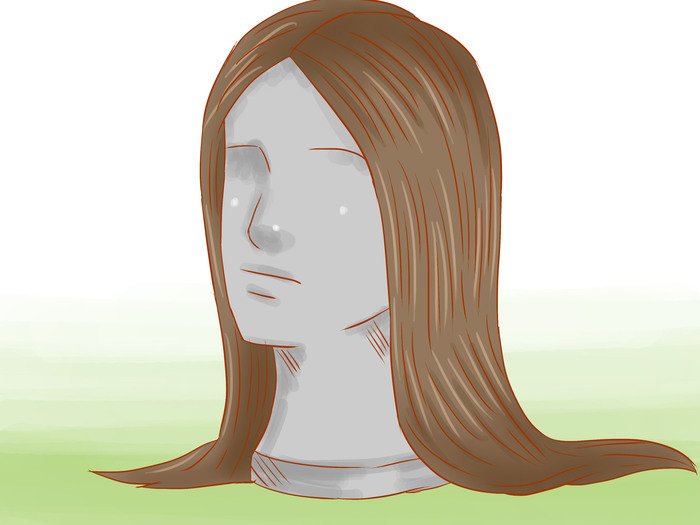 Separate the hair to form two or three ringlets. Wrap a light blue ribbon around your braids. The ribbon should be tied around the elastic, at the spot where the braid ends and the curls begin. The ribbon should be tied into small bows. If the ends of the bows are too long, snip them off. The ends should barely extend past the bows. Make sure the bow is a light blue, close to the shade of blue in the dress and socks. Purchase a wig. If you don't have long or dark brown hair, purchase or hire a simple long brunette wig. You can get a wig already plaited, or you can add plaits. Brown hair isn't necessary if you have the costume, the slippers, and the braids. 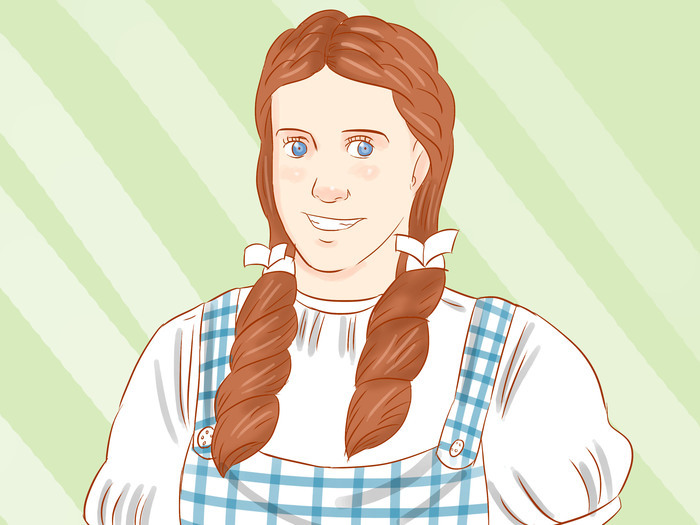 Completing your look with the dark brown hair depends on how closely you want to match the cinematic image of Dorothy. Carry Toto. 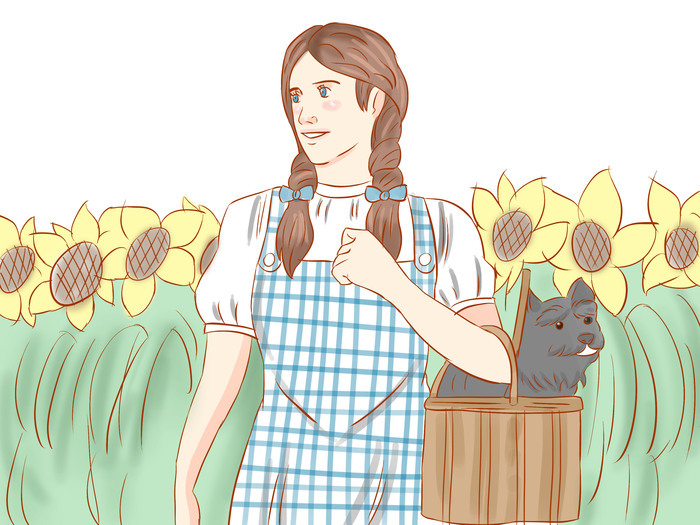 If you're dressing up as Dorothy, don't forget Toto! If you don't have a real dog, or a cooperative one, buy or use a stuffed toy dog. 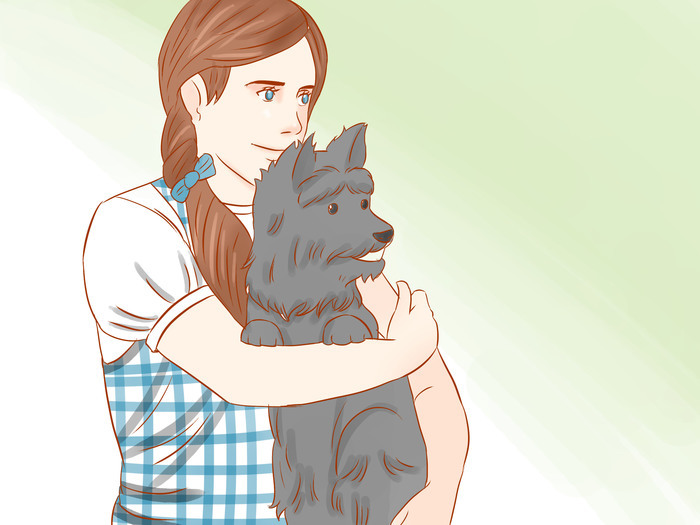 Toto was a darkly colored Cairn Terrier. 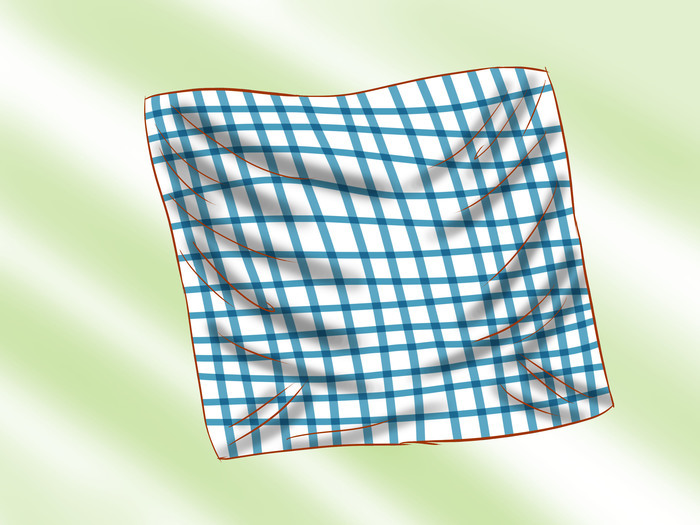 Many retailers sell stuffed Totos that you can use to complete your costume. Some places even sell baskets with removable Totos. Complete the look with a basket. Carry a small basket, such as a picnic basket. Toto often sat in the basket, so make sure there is enough room for your dog, real or stuffed! Dorothy's basket was open, so make sure your basket doesn't have a lid on it.